Engaging youth in the community design process is a means to empower and inform the next generation. As communities grow and change, citizen engagement and understanding of the built environment is crucial to the quality of growth. Through a grant from the James Stephen Turner Family Foundation, the Nashville Civic Design Center (NCDC) has created Citizenship in Action: Community Design 101, an activity-based curriculum that teaches youth about community design and civic engagement. 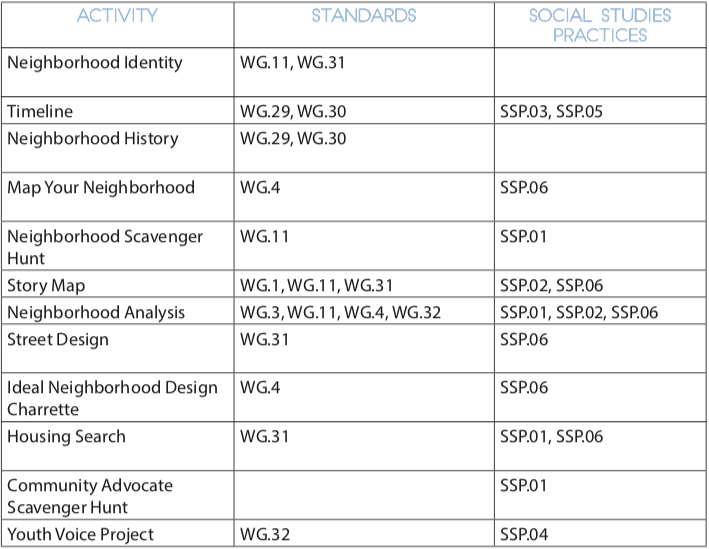 The curriculum provides activities that address one of the four topics: Neighborhood History and Identity, Neighborhood Design, Hot Topics, and Youth Voice. The activities can be stand-alone, or work as a whole unit for a course. Each activity has a guide for classroom facilitation, and aligns with content standards. The content of the activities are based onNCDC’s books that are listed below as primary texts. Raising student awareness of the world/community/issues around them. Empower students to realize they have the ability and capacity to enact/bring about change within their community. 2. Increase student skills in critical thinking, design, responsible citizenship, and community engagement. How was my community shaped? How is it still being shaped? What makes a community functional, healthy, and beautiful? What are the current struggles and successes of my community? How can I be an active citizen? The activities most directly connect to the course standards of World Geography. Freshman seminar is another good fit for the activities as they have a goal of community engagement, and develop many college and career readiness skills. Other courses that can potentially connect include Visual Arts and US Government and Civics. The “Youth Voice Project” is recommended as an a culminating assessment for any of the activities you choose to teach. The projects has youth apply what they have learned to an improvement idea for their own neighborhood. The curriculum is adaptable for grades 6-12. The activities and projects can be done on a variety of grade levels as there is flexibility in the rigor due to their open-ended nature. Each of the four topics aligns with a supporting question with the goal to teach the core question. Each topic has a series of activities that have guides. The Youth Voice portion contains a self-guided project where students can apply what they have learned to a community improvement plan. The majority of these activities can stand alone, although students will get a richer learning experience if you do them all. How was my community shaped, how is it still being shaped? This activity has students explore the impact that a neighborhood has on the identity of an individual and group of people. They will create a representation of their own neighborhood that portrays how they view its identity, and reflect on how their neighborhood has impacted their own identity. T his activity has students use context clues to chronologically order a series of historic images of that will tell the story of how historic events shaped their city. This activity has students represent different periods of time in their neighborhood’s history by having them draw on overlays of their neighborhood map. This short exercise transitions student’s thinking about their neighborhood to map view. In groups, they will draw a map of their neighborhood solely from memory of experience. This is a presentation that teaches students some basic knowledge of community design. 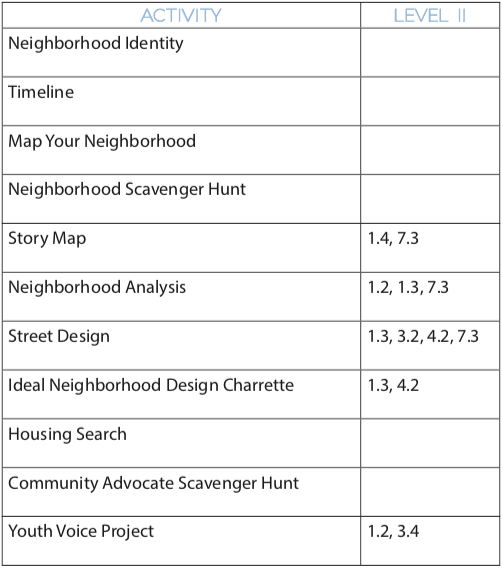 This scavenger hunt has students search for and experience different neighborhood elements in their community. As it requires students to be out independently exploring their community, it is intended to be an ongoing activity for students outside of class time. This activity has students explore the different types of neighborhoods (transect zones) by creating a map that tells the story of a day in the life of a community member in a transect zone. This activity has students do a neighborhood field study where they annotate a map as they walk through their neighborhood. Through the annotation process, students will learn about the neighborhood form and characteristics. This activity has students compare and contrast before and after images of streets in order to learn about street design that creates a strong community. The activity culminates in an opportunity for students to design their own street improvements. This activity leads students through designing an ideal neighborhood for youth. This activity has students explore housing availability in their community as they role play as a diverse range of citizens looking for housing. This scavenger hunt has students search for and experience different ways that citizens can stay informed and be involved in their community. As it requires students to be out independently exploring their community, it is intended to be an ongoing activity for students outside of class time. T his project gives students the opportunity to apply what they have learned in the previous activities to an improvement project for their own community. The process will be modeled after a Participatory Budgeting process that was introduced in Youth Voice Project Introduction. This is a presentation that highlights some careers in planning and design. Many of the activities have connections to how neighborhoods can influence the physical health of its citizens. The blue heart symbol points out these connections in the activity guides. The table below outlines which World Geography standards align to which activities. The standards are taken from the most recent draft of the Tennessee Social Studies standards as of 7/14/17. The table below outlines which United States Government and Civics standards align to which activities. The standards are taken from the most recent draft of the Tennessee Social Studies standards as of 7/14/17. The table below outlines which Architectural and Engineering Design standards align to which activities. The standards are taken from the most recent draft of the Tennessee Department of Education’s College, Career and Technical Education standards as of 4/16/17 . *Medium will need to be adjusted from markers on paper maps to AutoCad or hand drafting. The table below outlines which Engineering standards align to which activities. The standards are taken from the most recent draft of the Tennessee Department of Education’s College, Career and Technical Education standards as of 4/16/17 . All of the activities develop students' 21st Century Skills in some way. The content of the activities also exposes students to career fields such as city planning, architecture, and local government. These connections are shown below by a table that shows each activity’s alignment with Tennessee’s School Counseling and Career Guidance standards. The “21st Century Skills Reflection Questions” document that follows is intended to help students make connections to these standards. The following questions are recommended to use after your students have finished an activity. The questions help them connect the skills that they are using to college and career readiness. Describe the work that your team did together. How did your team make decisions? What did you do together that you couldn’t do alone? What did you learn from your team members? What problems did you have working as a team? What can you do next time to better work as a team? What new topics did you learn about? What new skills do you now have? Did any of the new topics interest you? Why or why not? Did you learn anything about people or communities that are different from yours? If so, describe what you learned. Describe how your team members work differently from you. Explain one way that a difference among your team benefitted your work. For example, one person might be good at starting conversations, another might be good at keeping the group focused, and another might be very creative. Describe how your team planned to accomplish your task. Why was a plan important to accomplishing your goal? What is one way your team can better plan next time? What happens here, or what services does this place provide? Take a Downtown walking tour to see historic sites and design elements. It is recommended to contact your local tourism, planning, or design organizations for tours that are already mapped out. Walk through a neighborhood that has different housing types, and identify each type. Visit your local library to see historic maps of your city. Ride public transportation, and interview a rider. Visit your local farmer’s market, and hear from a local farmer. Visit your local planning department or a design firm to see the career side of community design. Visit a nature center or land preserve to learn about the importance of nature preservation in the midst of development. Visit the rooftop or a lookout deck in your city, and identify different neighborhoods and points of interest.